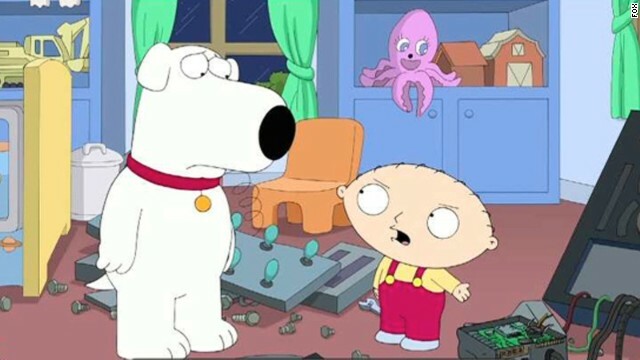 When Seth MacFarlane decided it was time to temporarily kill off "Family Guy's" dog, Brian, he was trying to teach a lesson. "It reminded people this is still a show where anything that can happen despite the fact it’s been on for awhile," MacFarlane explained to TV critics at the Television Critics Association's winter press tour. With that being the goal, MacFarlane considers the stunt a mission accomplished. But what he didn't expect is for the viewers to teach him a lesson, too. When Brian, easily one of "Family Guy's" best and most beloved characters, was hit by a car and couldn't be revived, fans lost their minds. Mourning commenced, threats were made and petitions were launched in the name of bringing back the Griffin family's dog - who, in a cruel twist, had already been replaced by another pooch named Vinnie. In the end, it's a lesson learned all around. "Family Guy" fans know that even the most revered characters may not be around forever, and MacFarlane knows that the dog has to stay. Don't take away a kids bff. Their a great pear together. Don't kill off the poor kids bff! That's like taking his Teddy bear away. Plus the two together is so funny. They make the show. Last I checked, HE created the show and has the right to change, remove, kill, erase, whatever, any character he wants to. The fans do not own the character, or the show or the storylines. Seth Macfarlane does. Why do people get so bent about stuff like that? Its like people want predictable. They want the mind-numbing routine. Don't like? Don't watch. It doesn't sound like he learned the right lesson...does it? Most of the commentary that I read were basically annoyed with what was sure to be a gimmick, or had people either saying "who cares?" or "oh well...next!" Similarly with The Weather Channel getting dropped from DirectTV and going on this tear about how DirectTV is putting people's lives in danger by depriving them of weather from them. I wonder if that network's owners are checking the feedback, because people have pretty much let them know that they have plenty of other and better options. I'm really suprised. I didn't even realize that the show was still on. That would be because no one watches anymore. We would rather watch Futurama and Archer...and keep asking ourselves how in the world is Family Guy and The Simpsons still on the air? "Family Guy" is still on? News flash: in a country of 350 million people there's more than one thing people like. Amazing, huh? Read all of the Games of Thrones books....found them boring and predictable. You aren't supposed to hurt puppies. Especially talking ones. That Seth guy sounds mean. He wanted to 'teach the audience a lesson'? He wanted them to know he could do anything he wanted with the show? Narcissistic much? Made me wonder about Seth McFarlane. The killing off a a major character, one who many of the episodes revolved around is rarely a good idea. It leaves a gap in the story line that is difficult to fill and it angers many of the fans. What was he thinking, if he has lost interest in Family Guy, then maybe it's time for the entire show to come to an end.